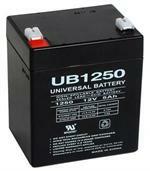 # UB1250: 12 volt 5.0Ah Sealed Lead battery. Universal Battery brand. Dimensions: Dimensions: 3 9/16" long x 4" tall x 2 3/4" thick. Weight: 3.52 lbs. For ground shipping costs, please note that $3 is automatically added per unit. UB1280: 12 volt 8.0Ah rechargeable sealed lead battery. Non-spillable. Spade lug contacts on top (3/16" wide lugs). Replaces most 12V 7Ah, 7.2Ah, & 7.5Ah sealed-lead type batteries. Used in emergency lighting, UPS backup, medical, etc. UB1290: 12 volt 9 Amp-hour rechargeable Sealed Lead battery. X-ref # RBC2, BP-420. Fits MANY applications (alarm systems, hallway emergency lights, portable 12V power packs, etc). Size: 5.95" x 2.56" x 3.7". Spade lug contacts on top. Weight 6.9 lbs. UB1270 : 12 volt 7 Amp (7000mAh) sealed lead rechargeable battery. Dimensions: 5 7/8" long x 3 5/8" tall x 2 1/2" thick. Weight: 5.45 lbs. Output: 12VDC, 7Ah capacity. Used in emergency lights, portable 12V powerpacks, UPS backup, et.